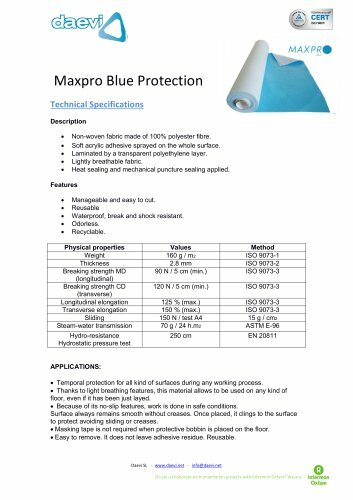 Maxpro Blue Protection Technical Specifications Description • Non-woven fabric made of 100% polyester fibre. • Soft acrylic adhesive sprayed on the whole surface. • Laminated by a transparent polyethylene layer. • Lightly breathable fabric. • Heat sealing and mechanical puncture sealing applied. Manageable and easy to cut. Reusable Waterproof, break and shock resistant. Odorless. Recyclable. APPLICATIONS: • Temporal protection for all kind of surfaces during any working process. • Thanks to light breathing features, this material allows to be used on any kind of floor, even if it has been just layed. • Because of its no-slip features, work is done in safe conditions. Surface always remains smooth without creases. Once placed, it clings to the surface to protect avoiding sliding or creases. • Masking tape is not required when protective bobbin is placed on the floor. • Easy to remove. It does not leave adhesive residue. Reusable. www.daevi.net • info@daevi.net Do you collaborate on humanitarian projects with Intermon Oxfam? We are.